There is a special place in Tantric practices for Yogini Sadhana, which is a part of the Shakti Sadhana, as the Yogini is believed to be a supernatural manifestation possessing a specific quality originating from the Universal Mother or the Adi Shakti. Most Sacred Tantric Sadhanas and rituals involve the collective worship of all the 64 Yogini together as can be seen from the ancient temples dedicated for the worship of the 64 Yogini. 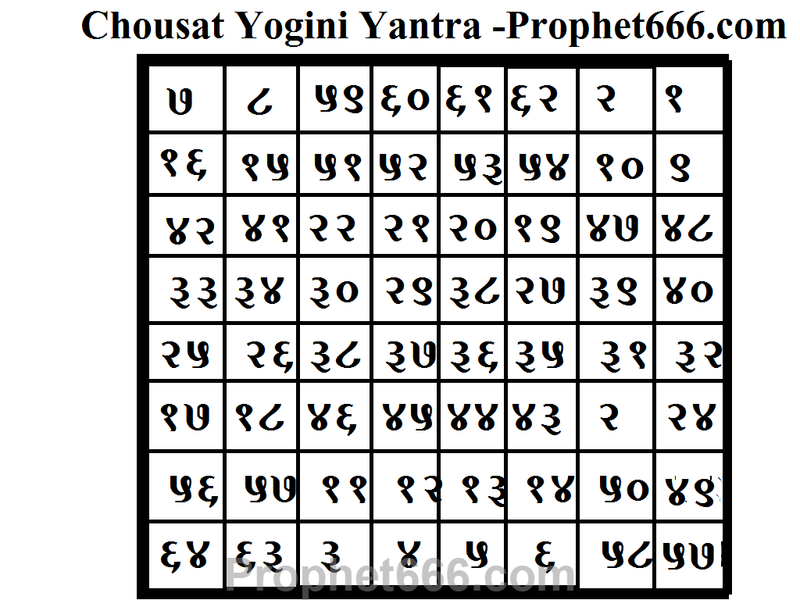 Coming back to the Chausat Yogini Yantra described in this post, there are more than one such 64 Yogini Yantras described in the Tantric texts. The one given here is a Yantra possessing a numerological combination, which is a representation of the 64 Yogini. The benefits of possessing this Yantra are immense and the Sadhaka is said gain spiritual and material wealth. The Chausat Yogini Yantra is prepared on a Bhojpatra by drawing it with the ink of Ashtaganda and using an Anar Kalam [stick of a pomegranate tree] as the pen. Then it is nicely folded and put inside a Gold Locket-Amulet and worn around the neck like a good luck attraction pendent. 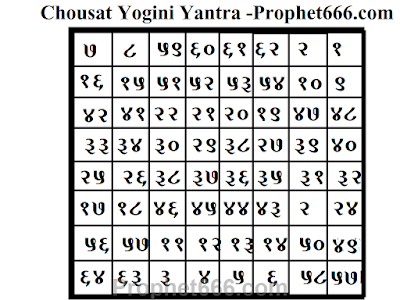 If the Chausat Yogini Yantra is desired to be installed inside the house or an office, shop or business premises then it should be prepared on Tamra Patra [copper sheet]. After preparing the Chausat Yogini Yantra is should be fully energized with offerings of Dhoop, Diya, Flowers and Bhog. If possible, a Havan can also be performed through a learned Tantric-Mantrik or Priest having deep knowledge and experience of actually performing Yogini Sadhana. Can a silver locket be used instead of gold ? Gold locket has been prescribed for this Yantra, so I cannot say anything about the effectiveness of using a Silver locket. Generally addition of all lines horz or vertically should be same. Here it is not.